It is possible that, somewhere along the chain of deposit expansion, an individual who receives a check will nor leave the proceeds in a bank checking account. He might put some cash in a cookie jar. Or some of the $1000 might be sent to a cousin in Argentina .nd used there instead ~fin the United States. The effects of such withdrawals on our analysis are simple. When $1000 stayed in the banking system, $1~,OOOof new deposits was created. If $100 ‘ were to leak into circulation outside the banks and • only $900 of new reserves were to remain in the banking system. the new checking deposits created would be $9000 ($900 X 10). 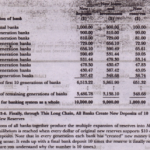 Therefore the 100 to l amplification would occur only if no reserves leaked from banks.